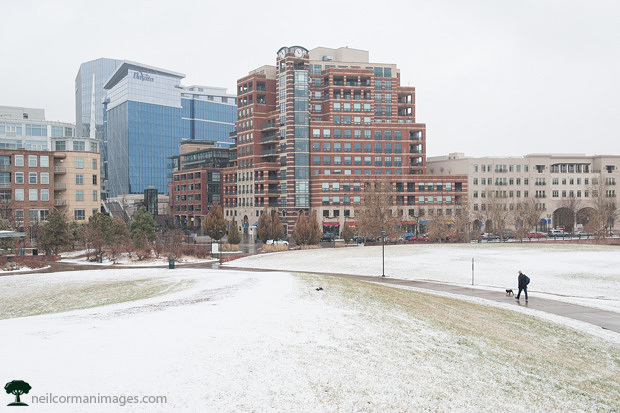 This past Sunday it snowed in Denver, alright it wasn’t that much snow and it was quickly gone but this was the first snow in the city in quite some time. I watched the snow come down from my home and soon noticed large fluffy flakes in the downtown area which got me out into the snow. I decided to head around Union Station to get some of the change taking place in the city and found myself across the bridge at Commons Park. Walking up the small hill the lines leading into the city with the sidewalk and also the accumulation on the hill got my attention for this image of a changing skyline from the area. One of the big events this year was the opening of Union Station after years of construction in the area. With the building transformed into a transportation hub it has attracted many visitors during the second half of the year. 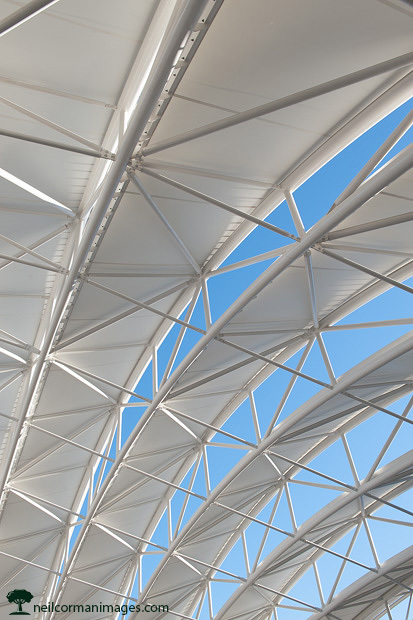 The architecture of the canopy over the tracks is quite interesting and on a sunny day I headed down to this area. As I looked up I noticed the lines of the canopy and how they tell a different story from the location you look at them within the Union Station area. I found a spot which would give me the repeating rows as well as a view of the sky in this image which I am sure won’t be one of the last I take from this area. If you have been by Denver International Airport in the past couple of years you have seen the new Westin Hotel being built at the south end of the main terminal building. 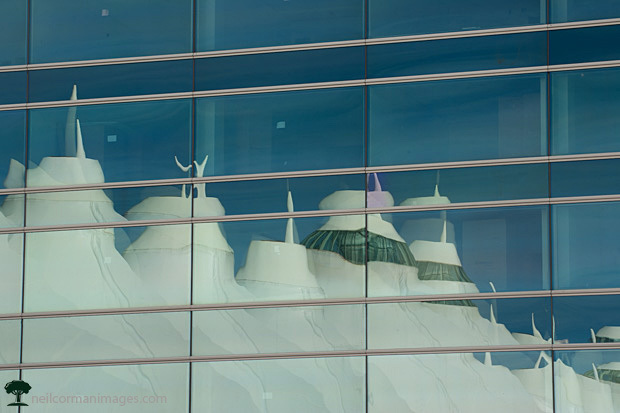 Now that the windows are in the hotel I have noticed the nice reflection the hotel provides of the “peaks” of the airport. While waiting for luggage to arrive over the holiday travel season I headed outside with my camera to capture this reflection. There is still some work to be done on this new Westin Hotel at the airport, but we now have a good idea of what the landscape at the airport will look like moving forward. 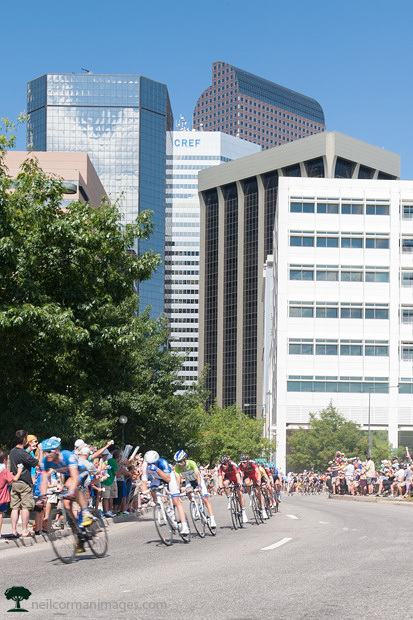 A few weeks ago the Pro Cycling Challenge ended in downtown Denver. After photographing near Civic Center Park I found a location on the final turn towards the finish line allowing the City of Denver to shine in the background as the cyclist made their way on the final tour. This was actual prior to the final lap in the circuit around the city. The turnout was great once again for this week long race through Colorado. 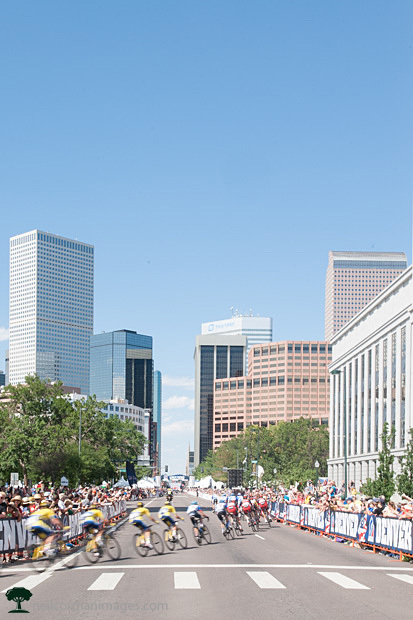 Once again this past weekend the Pro Cycling Challenge ended in Denver. This year I decided to head to the Civic Center Park area to watch the final laps prior to the finish of stage 7. I had some ideas of the area I wanted to capture as the racers headed by and was sure to get to that spot early so that I could get the location I thought would be best. In this image the racers are nearing the completion of their first lap and this is the peleton flying by in a single file line to try and catch up to the leaders of the race. As I mentioned last week, I was photographing downtown Denver from Cheesman Park when a storm moved into the city in early July. From my location I watched as the sky started to light up across Denver and continued to photograph from my location until it was no longer safe to do so. 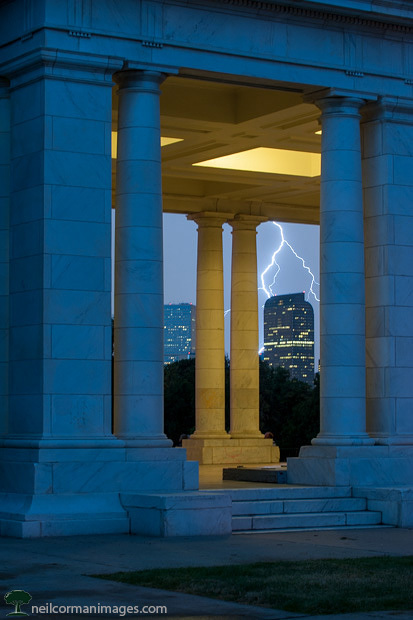 With a quick shutter I capture many images of the skyline including this one as lightning lit the Denver skyline through the pavilion at Cheesman Park. 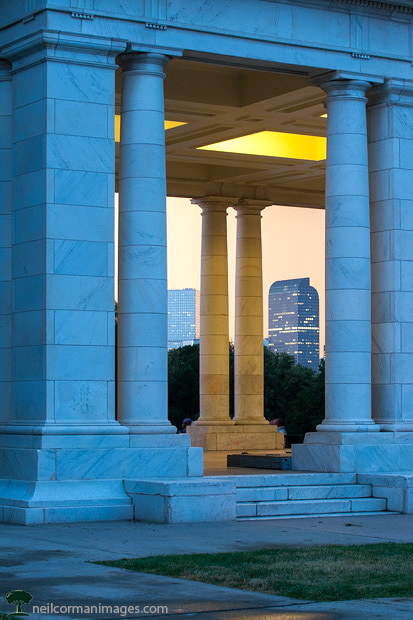 In early July I headed to Cheesman Park to capture sunset over Denver. I had photographed from this location before and had the idea of the shot I would like in my mind. Leaving my house it appeared a storm may be brewing and could obstruct the vision I had for that evening, however I pushed myself and got to the location just after sunset hoping to catch dusk over the city. The shot I got here I was happy with for the evening, however I still stuck around and next week we will see the change which took place over the next thirty minutes on that early July evening. 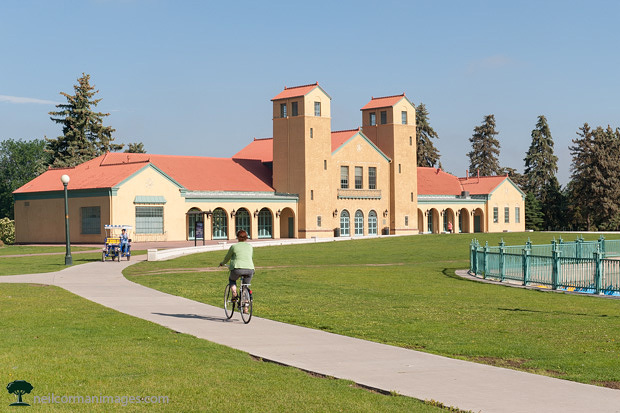 Summer is here in Denver and during the course of the day there is plenty of outdoor activity at City Park. As I made my way through the park I had plenty of runners and bicyclists pass by and approaching the center of the park I noticed this cyclist pass as the employees who rent bicycles start to bring items out for the day along this sweeping path. 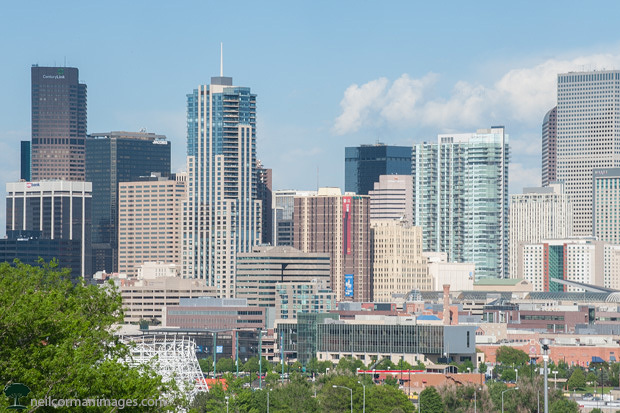 Driving home recently from an event I drove past Invesco Field and from there noticed the skyline on a nice spring day. Everything has greened out even with some later snowfalls this year and the skyline is filling in nicely from this vantage point west of downtown. With the constant building taking place in Denver the past few years it will certainty look different in the next few years or sooner. This past weekend the City Park Criterium took place. 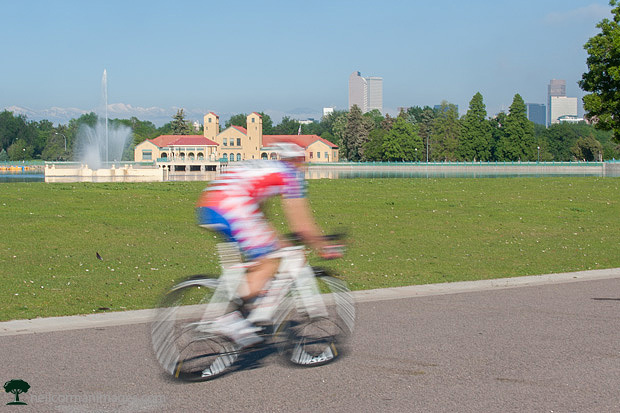 Once again this year I found a location at the east end of the course and captured the cyclists as they passed by with the pavilion, Denver skyline and Rocky Mountains in the background. Not too long after I captured this image, the clouds started to move in blocking the view of the mountains in the background so I walked through the park looking for new locations as well as scouting for the upcoming summer months. Look for some new City Park images in the next couple of months from some of these locations.